Well the possibility for those who need extra nasal cartilage in the nose for aesthetic or functional reasons but don't have enough existing nose cartilage, may soon have another option. On a previous post titled, "Regenerative medicine:Re-growing body parts" August 28 2010 I posted a video discussing in particular how a man was able to regrow his finger using a powder, and it discusses tissue engineering in general, however not for nose in particular. For those that haven't yet read my previous posts; harvesting cartilage from your own body is preferred method of choice for replacing, or strengthening missing or weakened cartilage in the nose. 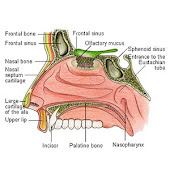 For the nose, the gold standard is nasal cartilage from the quadrilateral region of the septum. When there isn't enough remaining cartilage there because of previous surgical removal the surgeon can harvest cartilage or bone from, ribs, ears, cranium, or hips. Other sources can be from cadaver, or use of synthetic materials. All these are inferior choices to your own nasal cartilage and have their own unique set of drawbacks. However if cells from your nasal cartilage can be isolated and grown in a lab, to grow new cartilage then that would be the ideal. This research has been underway for couple years now at UC San Diego! "Researchers at UC San Diego have turned to tissue engineering to develop replacement cartilage for the nose. Dr. Deborah Watson says a small amount of cartilage is removed from the patient’s nose. Technicians isolate the cells from the tissue, then grow the cells to increase their number. The cells are then placed into a three-dimensional matrix, where they will continue to grow in number and form tissue. Enzymes and growth factors are added to encourage growth and formation of a harder tissue. Watson says it can take two to three months to generate cartilage that is strong enough to place back in the body. The surgeon will fine tune the shape of the cartilage before inserting it back into the nose. The “new” cartilage is either placed inside a pocket of soft tissue or sutured to remaining cartilage in the nose. Once in place, the engineered cartilage will continue to mature and become stronger. Cartilage tissue engineering is still in testing phases and not yet approved by the FDA. Watson says the process may eventually enable doctors to provide patients who need nasal reconstruction with an aesthetically pleasing and functional nose. Since the cells come from the patient’s own body, theoretically, there is no risk of rejection of the engineered cartilage." I really hope that researchers will soon conduct tissue engineering of the turbinates as well, for those who suffer from Empty Nose Syndrome. Except for parts of the sexual organs, which is not an option as donor site, there really is no other part of the human body that acts like or resembles the natural vascularness of the turbinates to be used for replacing lost tissue due to over resectioning.